The 1973 Milwaukee Brewers team achieved a few milestones, both collectively and as individuals. The team pulled off a ten-game winning streak for the first time in franchise history. It all started on Friday, June 8, in California, with an 8-2 win. The ’73 Brewers were starting to show a propensity for streaks. They ended May with four straight losses and fell to 19-26. Fans were beginning to wonder if a repeat of the 1972 record of 65-91 would be in store. 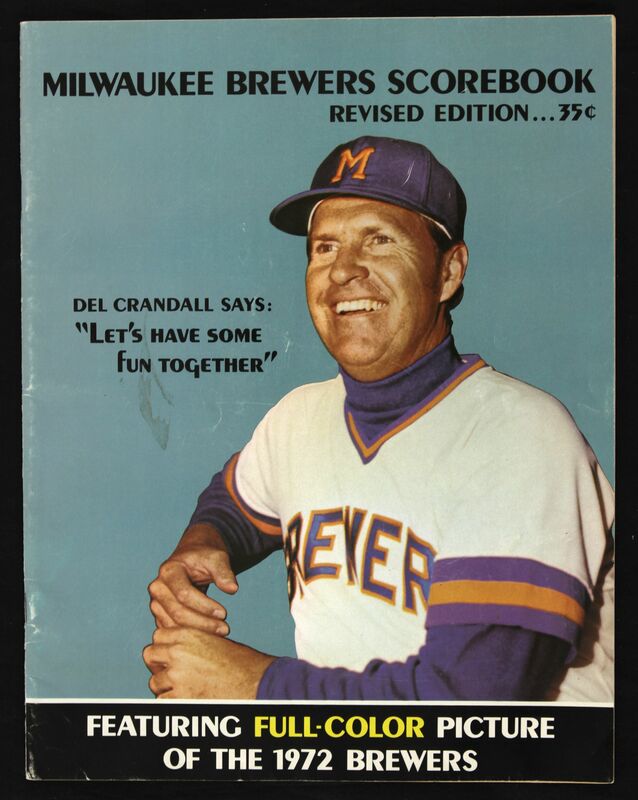 Former Milwaukee Braves catcher Del Crandall was managing the team in what would be his first full season at the helm. Another former Braves player ran the front office. Jim Wilson took over as General Manager after the 1972 season. It didn’t take him long to trade Jim Lonborg, Ken Brett, Ken Sanders, and Earl Stephenson to the Philadelphia Phillies for Don Money, John Vukovich, and Bill Champion. Money gave the Brewers a veteran presence that could play all over the infield, and Champion fit in nicely with the pitching staff. The 1973 season started on the road in Baltimore. The O’s and Brewers were able to get two games in before rain swept across the city and forced cancellation of the series finale. The Brewers headed back to Milwaukee where 13.8 inches of snow greeted them and postponed the home opener. After a six-day break, the Brewers got going again. They played to a 9-9 April, but backpedaled in May with a 10-17 record. Many of the games were close, but a couple of blowout losses (11-4 to New York and 11-1 to Boston) made the runs scored/runs allowed stats look worse than what they were. The team started to gel when the calendar flipped to June. They ran off five straight wins, starting with three against the Chicago White Sox at County Stadium. One of the wins was a walk-off in the bottom of the thirteenth inning. The Brewers moved on to Oakland and won the first two games there, but had the winning streak snapped by an 11-1 drubbing. While the Oakland series was going on, the Brewers drafted some kid named Robin Yount in the 1st round (3rd pick) of the MLB draft. Then the fun began in Anaheim. Righty Jerry Bell (6-6) went the distance to pick up the first win of the streak. Bell had pitched quite well out of the bullpen the year before and was on his way to posting a 3.97 ERA in 183.2 innings pitched, mainly as a starter. The Brewers offense scored their runs without the benefit of a homer. They beat up starter (and future Brewers 20-game loser) Clyde Wright and former Seattle Pilots swingman Steve Barber to pick up the win. Ollie “Downtown” Brown was the difference the next day in a 1-0 Brewers win. Brown became the first Designated Hitter in Brewers history on Opening Day, and in the DH role again he cracked a homer off Rudy May to back starter Jim Colborn. May had retired the first thirteen hitters he faced before Brown’s homer. Frank Linzy came into the game in the eighth inning to get out a jam for Colborn, and he pitched the ninth as well to earn his 6th save. Milwaukee won 8-6 on Sunday and returned to .500 at 27-27. The Brewers had an 8-4 lead going into the bottom of the eighth inning after Bob Coluccio hit a three-run homer in the seventh as the Crew pounded out 15 hits. Starter Jim Slaton ran out of gas and got into a jam, and Linzy came in and allowed two hits and two runs scored (both charged to Slaton). But Linzy got the final out of the inning and came back for a clean ninth to earn a save and seal the victory. “Anytime you get 15 hits off the Angel pitching staff, you know your hitters have done the job,” Crandall said. The Brewers traveled to Minnesota and kicked off a three-game series on Monday night. They had an 8-1 lead by the middle of the fourth inning off starter Jim Kaat, but the Twins eventually cut the lead to 8-5. Three hits and a walk off former Brewers closer Ken Sanders led to two more runs in the ninth and the Crew held on for a 10-6 win. Linzy pitched for the third game in a row to pick up his 8th save. Crandall had called a meeting a few weeks earlier after his team dropped three straight to Minnesota. He wouldn’t deny calling the meeting, but also said he couldn’t take credit for the Brewers winning nine out of ten games. Milwaukee’s offense had a hard time getting on track the next night against Bert Blyleven. It took until the seventh inning when three singles and a Don Money triple chased Blyleven. By the end of the frame, the Brew Crew sent eleven men to the plate and took a 5-2 lead. 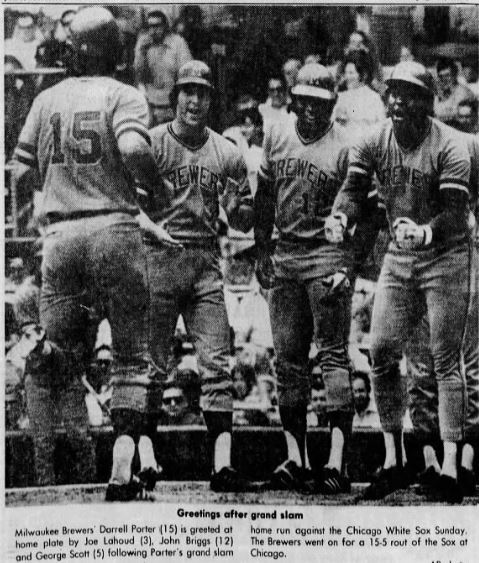 They held on for a 6-3 win, but not before the Tony Olivia and Rod Carew made it interesting by reaching base to start the ninth inning against Rob Gardner. Linzy again came in to clean up the mess and earned yet another save. Wednesday’s game saw the Brewers again get behind early. Colborn started and gave up three runs to the Twins by the fifth inning, including a solo homer to Carew. But Colborn dug in and escaped a couple of jams, including Jerry Terrell trying to score in the eighth inning from third base but getting tagged out by catcher Ellie Rodriguez. Left fielder John Briggs smoked a two-run homer in the top of the eighth to give the Brewers a come from behind 4-3 win. The road trip continued with a visit to Chicago. Milwaukee had Thursday off before starting a three game weekend series. Jim Slaton matched up against veteran star Wilbur Wood on the mound. Wood would (ha ha) go on to win 24 games for the second year in a row and already had 14 under his belt. In this game he pitched well enough to win, as he allowed just five hits and walked three while striking out nine. But the Brewers prevailed, 1-0. Slaton worked around seven hits and three walks in picking up his fourth win. Bill Melton had two doubles off Slaton, but couldn’t advance in both cases. Milwaukee didn’t score the game winning run until the top of the eighth. Wood didn’t help himself by walking Briggs and hitting Rodriguez with a pitch. Eventually Rodriguez wound up at third after stealing the base on Wood. Rodriguez said after the game that he wasn’t being held on, so Crandall gave him the green light to swipe the bag. He scored on Pedro Garcia’s sacrifice fly to center. The Brewers used four hits and a walk to jump out to a 4-0 lead on Saturday night. Steve Stone started for the White Sox and settled down after the outburst. He pitched the rest of the game, but the Sox couldn’t get anything going to get him off the hook. The game got called in the bottom of the eighth due to rain and the Brewers had a 4-1 win. A total of 33,392 were on Sunday to watch their White Sox, but the crowd thinned out pretty quickly. The Brewers scored 15 runs in 16 hits and won 15-5. They had a 10-0 lead after the third inning and terrorized every White Sox pitcher that took the mound, especially starter Stan Bahnsen and Rich “Goose” Gossage. It was grand slam day – Darrell Porter hit one off Bahnsen and Joe LaHoud hit one off Gossage. Lahoud ended with six runs batted in to lead the team after coming into the game with a .137 batting average. Don Money and George Scott contributed three hits apiece. Milwaukee finally returned home on Monday to start a three-game set with the Boston Red Sox. A good crowd of 22,796 settled into County Stadium and watched the Brewers fall behind 2-0, only to storm back with a four run third inning and a three run sixth. Milwaukee won 8-3 behind two homers from Scott. Colborn went the distance and improved to 9-2 on the season. He gave up a consolation solo homer to Carlton Fisk leading off the ninth inning, but by then the game was out of reach. With the win, the Brewers improved to 34-27 and had a 1.5 game lead in the Eastern Division. Unfortunately, the winning streak came to an end the next day when the teams locked horns in a doubleheader. Milwaukee held a 4-1 lead after three innings in the first game, but couldn’t hold off the Red Sox in the late innings. Slaton gave up a couple hits in the eighth inning and turned things over to Linzy, but this time the closer was unable to shut the door. A fielding error and two more hits allowed the Sox to tie the game 4-4. Two errors, a walk, and a three-run homer by Fisk ran the score to 8-4 in the ninth inning. Milwaukee went down in order in the bottom of the ninth at the hands of starter Marty Pattin and the streak was over. Ten wins came in the course of eleven days and nine of those wins were on the road. 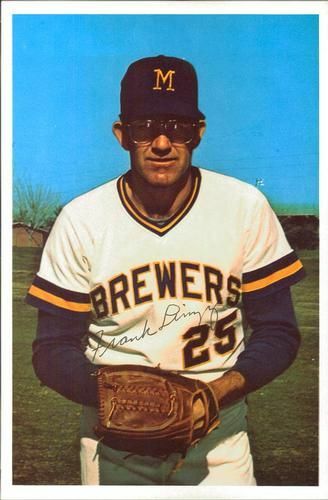 Three of the ten wins in the streak were awarded to starter Jim Colborn, amid his 20-win season, the first in Brewers franchise history. Colborn had an interesting path on the way to 20 wins. He started a game on April 6, then moved to the bullpen for a month and even picked up a save on April 18. He got his win of the season in relief four days later after pitching all nine innings in relief of Bill Parsons, who didn’t record an out in the first inning. After another win in relief, Colborn found himself back in rotation on May 9. Colborn reeled off five straight wins in June and posted a 5-1 record that month. Four of those victories were complete games, including another shutout. His performance helped lead the Brewers to an 11-1 road trip and 15 wins in 16 games. The Brewers posted an unexpected 18-10 record for the month of June. It boosted the Crew to above .500 at 37-35. They ended June at 3.5 games out of first place. Milwaukee continued playing streaky ball through summer. They pulled off a five-game winning streak in August and won seven of eight in that stretch. A four-game winning streak to close out August left the Brewers with a 66-67 record, 5 games out of first place. The team looked like they had the tools to pull off the first .500 or above season in their young history. A spate of injuries and lackluster play in September led to an 8-21 month and a 74-88 record overall. Despite the rough ending, players looked ahead with optimism. Colborn had twenty wins under his belt. George “Boomer” Scott also made franchise history by becoming the first hitter with 100 RBIs. He hit the century mark when he drove in two to back Colborn’s 20th win. Things were looking good for 1974, but the team would only improve slightly.